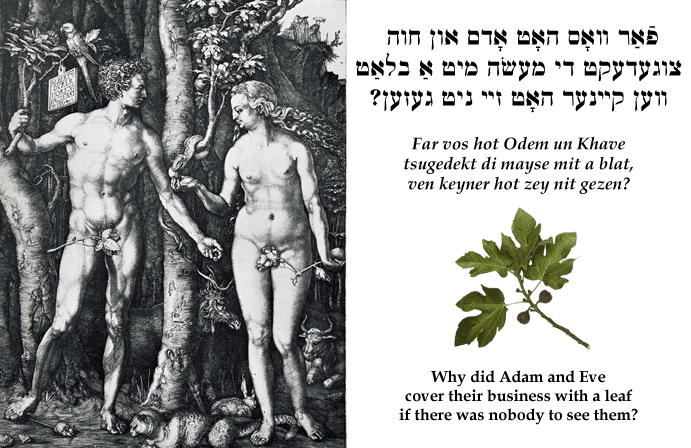 Yiddish Wit: Why did Adam and Eve cover their business with a leaf if there was nobody to see them? פֿאַר וואָס האָט אָדם און חוה צוגעדעקט די מעשׂה מיט אַ בלאַט ווען קיינער האָט זיי ניט געזען? Far vos hot Odem un Khave tsugedekt di mayse mit a blat, ven keyner hot zey nit gezen? Why did Adam and Eve cover their business with a leaf if there was nobody to see them?